It feels like it took forever to get the chance to read it, but I did, and I’m done, and I loved it! 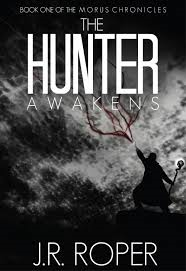 The Hunter Awakens is a great YA story that everyone should read; adults included. The setting is described in ways that have you feeling like you are right in the center of all the action. The characters have depth, and you immediately feel like they are friends you have missed, or family you haven’t seen in quite some time (assuming you like your family!). You hear bits and pieces about Mel, or Hellish Mel, as she prefers to be known. She has a mission of her own, and it is not the mission she was tasked with. You have witches, wizards, and sorcerers, but only one treasure hunter; Ethan. He and his sister Destry have a far more exciting time at their Grandparent’s than they were expecting. There is a bond built with the grandparents, and it is nice to see this type of relationship play out. As Ethan discovers his destiny, with a little help from his sister, he is set to begin on a path that will change his life forever, and could likely change the world as they know it. This is the first of what I hope is going to be an extensive series of books, and I cannot wait until I can start reading the second one!